Five Little Monkeys Collection #1 contains five delightful tales of five little monkeys who don’t always get things right, but they have a great time! This great app contains: Five Little Monkeys Jumping on the Bed, Five Little Monkeys Bake a Birthday Cake, Five Little Monkeys Wash the Car, Five Little Monkeys Sitting in a Tree, and Five Little Monkeys With Nothing to Do! Numerous life messages for our kids in all of these stories in a format sure to entice them! 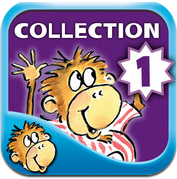 Each book features its’ reading readiness assistance. This is so important for our kids to be able to see and hear words used in context! You can also zoom in and pan out on the pages! This app is presented to us by Oceanhouse Media. Five Little Monkeys Bake a Birthday Cake! Five Little Monkeys Wash the Car! Five Little Monkeys Sitting in a Tree! Five Little Monkeys With Nothing to Do! **Parents note: A link to OM’s site is in the app. If you want to change the iPad settings go to our Parents pages and view the video for that.